Dolphins routinely produce 10 times more power than the fittest human athletes do, concludes a new study on the herculean marine mammals. The discovery helps to explain why dolphins seem to swim with ease next to boats propelled by powerful engines. At first scientists thought dolphins always benefited from some kind of fluid-flow trickery, but now we know the truth: Dolphins are ultra strong. The study is published in the latest issue of the Journal of Experimental Biology. Lead author Frank Fish (that’s his real name!) is a talented researcher whose work I’ve covered before. He heads up the Liquid Life Laboratory at West Chester University, where he’s also a professor of biology. Prior to the study, Fish and his team had a clear goal in mind. “Let’s see how much power a dolphin can produce,” Fish said in a press release. But that was all just theoretical. He and his colleagues tried out something very unexpected. 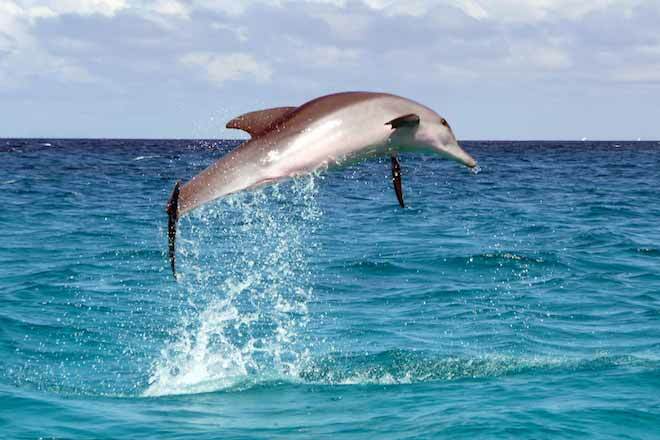 They used a technique designed to measure the muscle power of Olympic athletes on dolphins. To do this, Fish and colleagues Timothy Wei, Terrie Williams and Paul Williams studied a pair of dolphins named Primo and Puka. With a SCUBA tank of compressed air and a garden soaker hose, the researchers produced a curtain of bubbles at UCSC’s Long Marine Laboratory. Filming the marine mammals as they swam along the length of the bubble curtain, the team could clearly see the vortices set spinning by the dolphins’ flukes demarcating the powerful jet of water propelled backward as the animals surged forward. Calculations based on the measurements of these vortices reveal how much power a swimmer is producing. In the confines of the experiment area, the dolphins cruised by at just over 3.4 meters (a little over 11 feet) per second. While doing so, they produced an impressive 549 watts. We usually think of watts in terms of light bulbs, but a watt, indicated with the “W” symbol, is an overall measure of power. When the dolphins accelerated, they generated a surprising 5,400 W, making them 10 times more powerful than the fittest human athletes. Fish next hopes to try the power measurement method on even larger animals.